Monday March 12 1911 It was such a nice day. Will helped me work and he hauled cinders in the afternoon. I ironed & baked bread and cake. 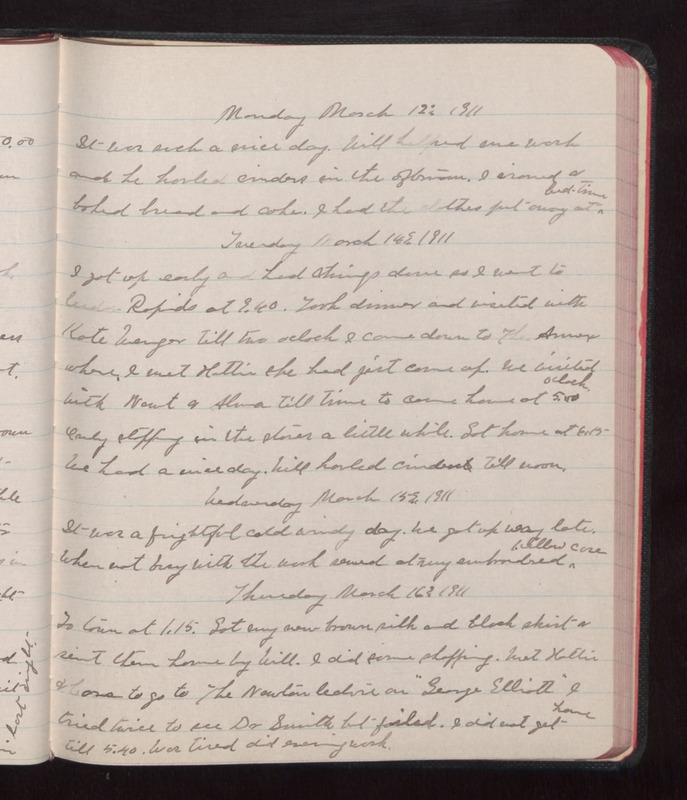 I had the clothes put away at bed-time Tuesday March 14 1911 I got up early and had things done so I went to Cedar Rapids at 9.40. Took dinner and visited with Kate Wenger till two oclock I came down to The [Annex?] where I met Hattie she had just come up. we visited with Newt & Alma till time to come home at 5.00 oclock. Only stopping in the stores a little while. Got home at 6.15 We had a nice day. Will hauled cinders till noon. Wednesday March 15 1911 It was a frightful cold windy day. We got up very late. When not usy with the work sewed at my embroidered pillow case Thursday March 16 1911 To town at 1.15. Got my new brown silk and black shirts sent them home by Will. I did some shopping. Met Hattie & Cora to go to The Newton lecture on "George Elliott" I tried twice to see Dr Smith but failed. I did not get home till 5.40. Was tired did evening work.